Check the complete information about RRB Bhubaneshwar Group D Recruitment 2018-2019 Notification. To help the Job Hunters in the Odisha state, here we are presenting this new article. And it contains all the important information that is mentioned by the Railway Recruitment Board Bhubaneswar Officials. As per the data in the official notification, there are total of 1532 Track Maintainer Grade IV (Trackman), Gateman, Pointsman, Helpers in Electrical/ Engineering/ Mechanical/ Signal & Telecommunication departments, Porter & Other Vacancies. And all these come under Group D. Therefore, all the people who are searching for the Government jobs that too particularly for the Railway jobs should check them. And all the contenders can make use of this chance by applying before the final date. All the applications will be accepted until 31st March 2018. And that will be the closing date. Consider this and hurry up to check the information. RRB Bhubaneshwar Group D Recruitment 2018-2019 Notification is issued by the Railway Recruitment Board Bhubaneshwar Officials. And this is catching a lot of attention. And yet many of contenders, do not even know about the basic details such the Educational Qualification, Age limit, Age relaxation, Selection Process, Application Process, Salary, Procedure to apply and many other things. Therefore, keeping all these requirements in mind, here we are writing this post. Now, all the people who are in job search in the Odisha State can make use of this RRB Bhubaneshwar Group D Recruitment 2018-2019 Notification, if they are having all the qualifications correctly. Advertisement of the RRB Group D confirms that the applicants should have done their 10th class or ITI or its equivalent from NCVT or SCVT in India as the desired educational qualification. And for experience and Specializations stuff. Check the advertisement clearly. First of all, check the above table. This will let you have a clear idea about the details mentioned in the official RRB Bhubaneshwar Group D Recruitment 2018-2019 Notification. Now, as per the information in the official advertisement, all the contenders should pay the Application Fee. All the General Category people are asked to pay Rs.500 as the application fee. And the applicants from the SC/ST/ Ex-serviceman/ Women should pay Rs.250/- as the application fee. And take some time and try to check the advertisement or the official portal of the Railway Recruitment Board Bhubaneshwar twice before making any payment. Remaining all other information is given in the next sections of this post. Check them all. So, as mentioned earlier in this article, the RRB Bhubaneshwar officials issued this new RRB Bhubaneshwar Group D Recruitment 2018-2019 Notification. And through this, they mentioned about the availability of the 1532 Grade IV Vacancies. So, all the people who are eligible and wants to apply can submit the application form before the closing date. And all the contenders should notice that the officials of the RRB Bhubaneshwar asked the candidates, to possess some requirements. So, one in such eligibilities is age limit. According to the information in the Railway Board Bhubaneshwar Group D Recruitment 2018 Notification, the minimum age is 18 years while the maximum age is 31 years. And for age relaxation, you can always check the official notification. For the sake of the people, in this article, we are even attaching the official RRB Bhubaneshwar Group D Recruitment 2018-2019 Notification. All the contenders can find the link to download the advertisement at the end. Simply by clicking on the link, you can download the notification. Now, coming to the important section, that is Selection Process. So, the officials of the organization are in the mode of conducting the Recruitment Rounds. As part of the RRB Bhubaneshwar Group D Recruitment 2018-2019 rounds, contenders should participate in them. Written Test (Computer Based Test), Physical Efficiency Test (PET), Document Verification, Personal interview are the rounds. All the contenders who will clear the first rounds will go to the next round. Remember that only merit will be considered. keep this in mind and prepare. For your sake, our team even gathered some preparation materials. Therefore, check them and prepare according to them. Those people who will get placed will receive Rs.18,000/- per month as the Salary. Though the officials of the RRB Bhubaneshwar didn’t mention about the Grade pay and other incentives in the advertisement. Down in the sections, you will find important details about the Name of the Vacant positions along with the number of positions available, Age limit, Age relaxation, Educational Qualification, Selection Process, Application Fee, Salary, Grade pay. Therefore, check them all properly. And finally, you all should remember the fact, that the officials will hire an individual as per the performance in the Recruitment rounds only. Therefore, following are the selection rounds all the people have to face. Recheck and submit before the closing date. 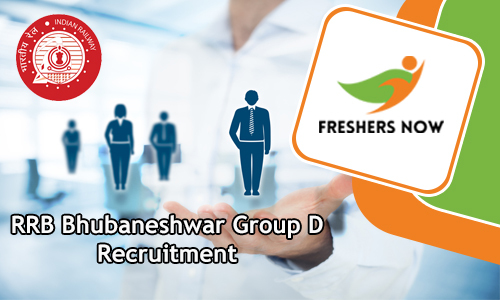 Our team from the Freshersnow.com is hoping that you are satisfied with the information given about the RRB Bhubaneshwar Group D Recruitment 2018-2019 Notification. For more such updates and Notification, visit us back.